I would like if this app is upgraded, I love it but it can’t send pictures or videos. This make it not nice. 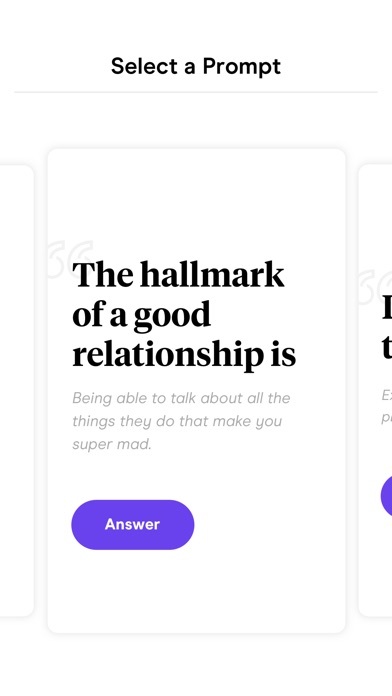 I’ve been researching all dating apps and for a brief period, Hinge was horrible but straight forward then it caught traction and became a viable source for the genre. Then they sold out to MatchGroup. Once that happened, the same old crap which is the destruction of the genre via greed. Any MatchGroup product is a product to pass on. Having said that, there are too many f***k boys to show MG that their product is fictitious and should be regulated after they are prosecuted and fined to the fullest extent of the law. 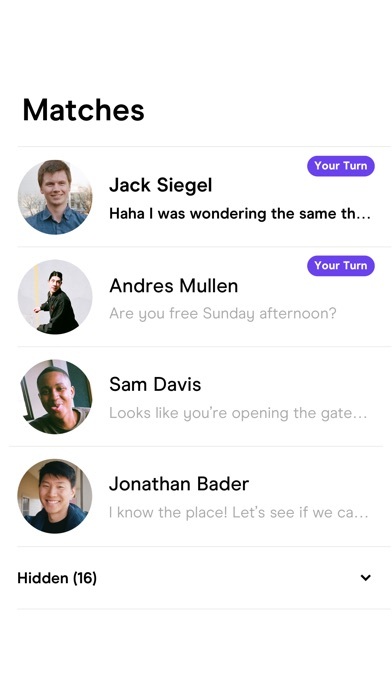 HINGE - here are the gimmicks by the fake female profiles and bots for you to look out for. 1) most of the women are fake and are based on Lagos, Nigeria. 2) references to Avocados, Game of a thrones, Star Wars, sharks in swimming pools. Playing with the dog at a party or your need to love dogs (I have an American Bulldog Puppy btw) mentioning adventure, sarcasm references. 3) mostly all connections are oversees and you will never see them. 4)I paid the $10.99 which is an experiment to make a price point that men find risk worthy, absolutely nothing happens or is gained by paying this price. 5) These women are not here for the most part and the ones that are, are out numbered at least 60 to 1. Yes you heard me. 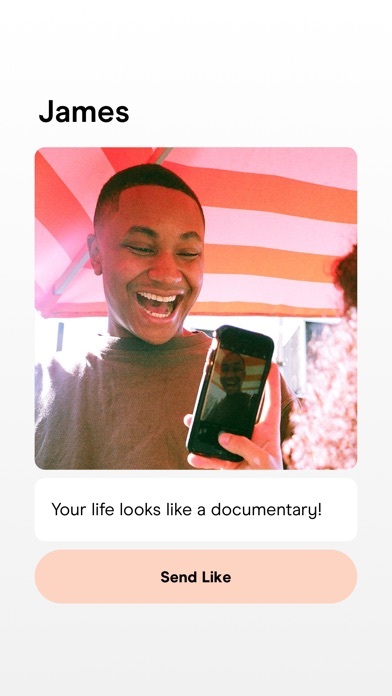 I researched and tested this site and OKC which is at least 100 to 1 6) She will eventually cause an argument to prevent seeing you or make up an excuse to exchange numbers or verify their identity. Oh boy, they get super heated when you ask to verify. 7) By luck I was bake to get a scammer to admit to me what the game was on GOD and they are hired out of Nigeria and other countries. 8) references to pineapple on pizza, desire to or visiting multiple states, loud chewing, getting stuck on a foreign country, etc. The point here is that you have multiply people writing multiple profiles and they aren’t smart enough to change it up so they keep repeating the same stupid lines that are only heard here for the most part. At the end of the day Match Group stays around because of you. So if you pay money and it doesn’t work out don’t complain or at least share your experience. My reviews are almost always deleted so if you see this consider that a blessing. If anyone would like to help change the genre and be a part of the movement to render MatchGroup irrelevant go to PLUGSBY DOT COM and reach me on the Forum page. Otherwise enjoy another MatchGroup product and I hope you are all bunny rabbits because all they do is dangle carrots and destroy decent app companies. 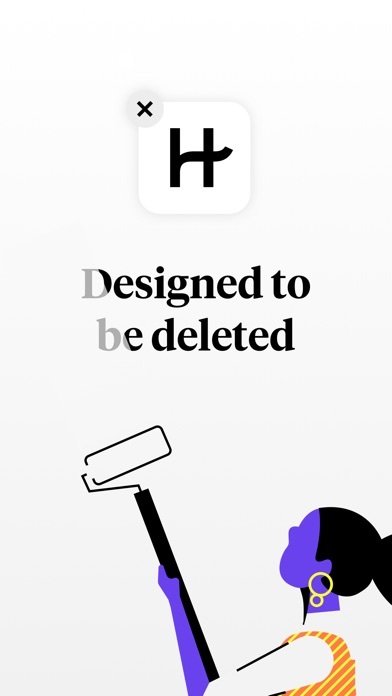 The app is alright. I notice a lot of profiles don’t populate, or the first picture won’t populate for some reason. I have the most up to date version and most up to date iOS. Feel like it could be an app glitch. Also, a red notification stays on the app to remind you it is your turn to speak.. but this happens even after we’ve exchanged numbers etc and aren’t speaking on the app anymore. Once I “read” a message, the app should recognize that and the notification should go away. Got tired of reporting scammers on this app. Maybe it’s because I live in the burbs, but there were no real options with this app compared to others. 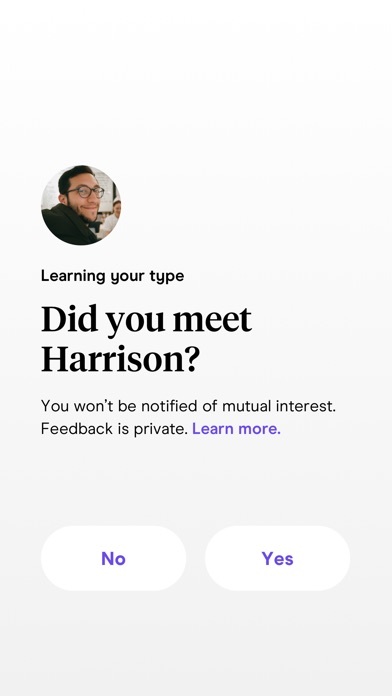 I started using this app a few weeks ago and really like the idea and look of it however I started to notice that the same guys I had “said no” to were now populating under my LIKES section or I would get a notification saying “we think you two should meet”. Umm clearly I don’t think we should meet and they should not populate under my likes if I’ve already hit the x button on them. To further make things irritating, I just downloaded the newest update and now I can’t see these likes all at once unless I now pay. 🙄 I’m really discouraged to keep using this app especially when I’m now forced to pay to see all my “likes” when some of them I’ve already said no to. 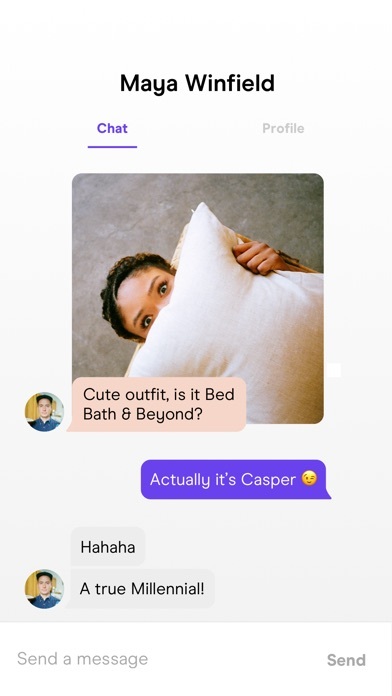 Cliffs: got an awesome gf from this app. Background: I’m a 30 y/o male, in-shape and a resident physician. I had little to no luck with just about every dating site out there (barely any matches, even fewer conversations and actual dates). 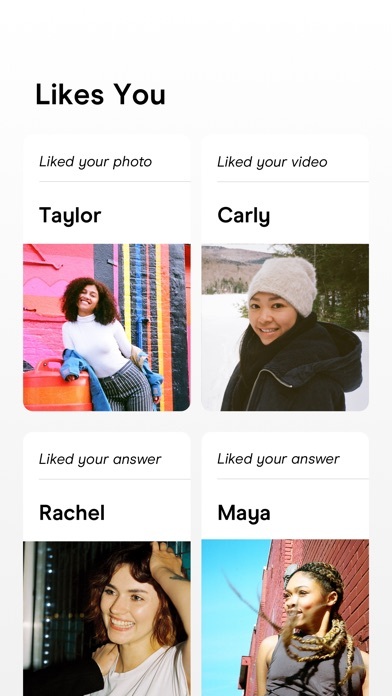 Compared to other apps like bumble and tinder I found hinge much better as you can use information from other peoples profiles as a conversation starter (as opposed to simply swiping left or right). 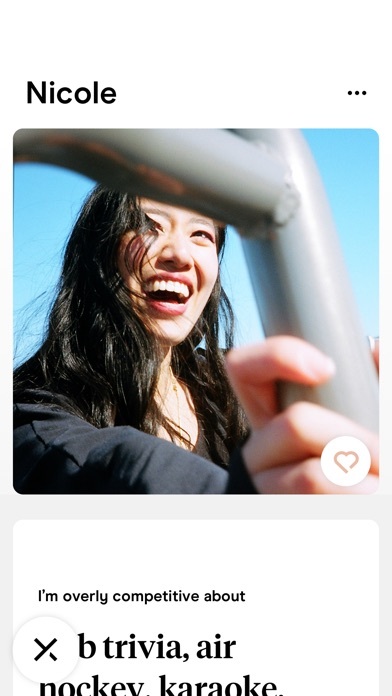 I also found the quality of women on hinge to be much better. You’ll still need to try and match a lot of people as some may not respond, conversations will fade, or you may go out but things don’t go past a few dates. Keep trying. I did and after going out with a few different people I found a great girl and we’re now a couple. Thank you hinge for bringing us together. Was good, then got greedy. I’ve only used the app for a few weeks and was having a good amount of girls to see and potentially like. I never ran into a cap on the number of likes or comments I could make on profiles, but the recent update from a few days ago put a cap of about 10 likes PER DAY. This cap makes it nearly impossible to get a decent pool of likes out there unless you pay for it cause girls on here do not send likes themselves. Since responding girls who are of interest are rare the unlimited likes helps your chances. This is all pointless with that cap, don’t pay money for this app, there are better options that are actually free.